Ceiling at 9'-4`` throughout the first level. Interior look suggesting three different living rooms and two dining areas. Original kitchen with a walk-in pantry. Master suite suggested on the first level as well as on the second level and four other large bedroms. Well-integrated triple garage. Question: What is the roof pitch for this plan? Is it all one pitch or are there multiple roof pitches? Question: What is the turnaround time for the slab (one pour, monolithic)? Answer: Hi, the plan is ready to send with the monolithic slab. No delay ? Question: Is plan 76131 designed for concrete building ( bricks) or refabricated houses? This plan is designed for concrete block construction but is also available in 2"x6" construction at no extra charge. 1st level: Ceiling at 9'. 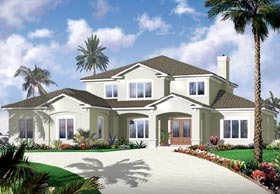 Entry, game room, living room and dining room, kitchen, dinette, family room, master suite, laundry room and triple garage. 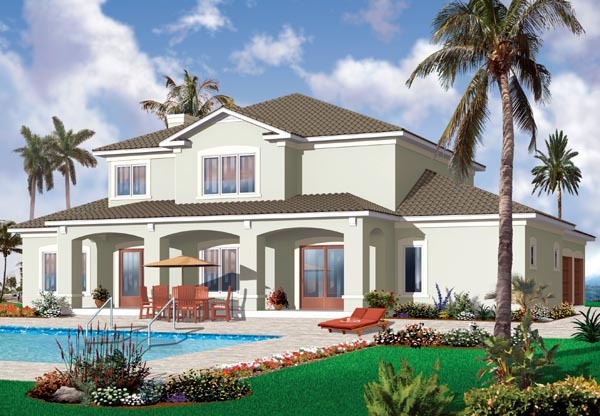 2nd level: Five bedrooms and three bathrooms including a private bathroom in bedroom #2 or the guest suite.